It's a bank holiday weekend here and I am really not up to much! Sniffle! Cough! Splutter! Groan! Yes! I have Man-bonic plague! Today's blog post nearly didn't happen. Not because I have been feeling like death for over a week now (I did manage to go to work and infect a large proportion of the operating theatre staff) but because I managed to infect Mrs S too and it mutated into something much worse...She-bola! As a result of this plague in the Sadler household death nearly did visit me in the form of a vengeance-seeking woman! Luckily I am just fit enough to evade her grasp/knives/lasers! 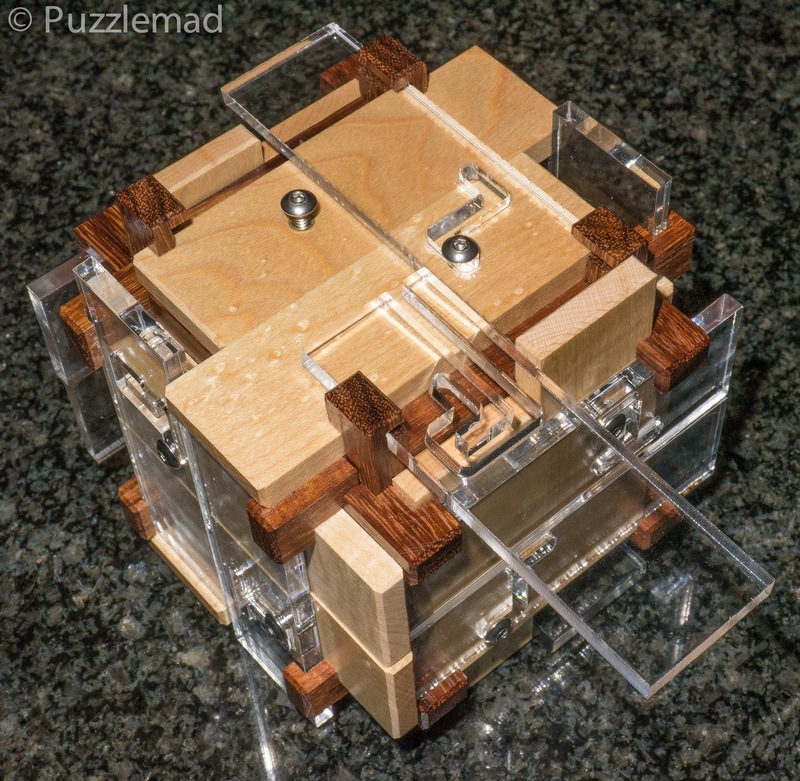 Today, I am focussing on some assembly puzzles that have finally fallen to my feeble skills recently. 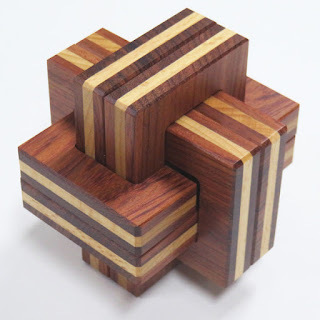 The puzzle above is the latest offering from Michail Toulouzas - offered by my friend Bernhard Schweitzer. It is the Puzzle Splines which is a relatively new idea from Michail. 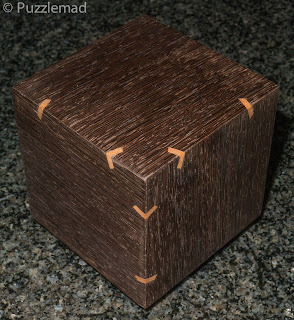 It was offered either in Sugar Maple with Pink Ivory splines or, as in my copy, there were a few made from Wenge with the Sugar Maple splines. I cannot resist contrasting woods and chose this. It is pretty big at 11cm across and forms effectively a cube with triangular outcroppings from it. It certainly is stunning and quite heavy. 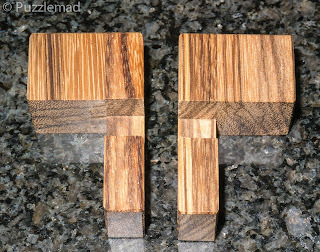 Even in my totally befuddled, drugged to the eyeballs state, I was able to see a few of the possible assembly patterns of the basic frames and managed quite quickly to assemble something that had an interesting position of the splines that even I could tell was impossible to assemble the remaining corners on. Back to square one. Luckily there are only so many ways to assemble the frame and on my second attempt, I found an assembly that worked. 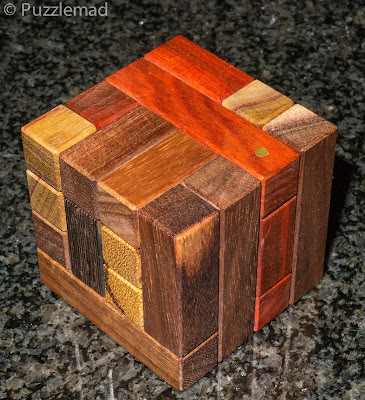 I had solved a puzzle under the influence of a very strong cold remedy...maybe I should solve all my puzzles that way? 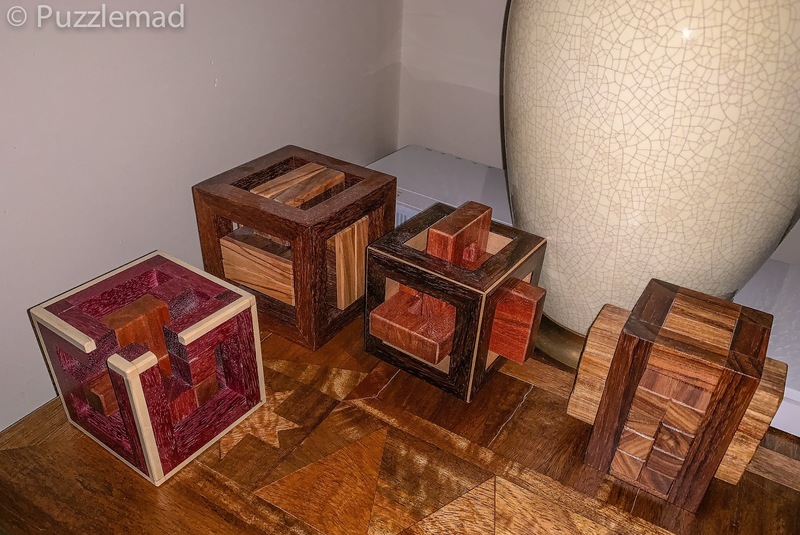 Flushed with success at assembly, I threw caution to the wind and climbed the arduous mountain of (13) stairs in my house to the upstairs puzzle room and retrieved the Kubikub 2 puzzle that I had bought a few months ago from My lovely Turkish friend, Yavuz Demirhan. 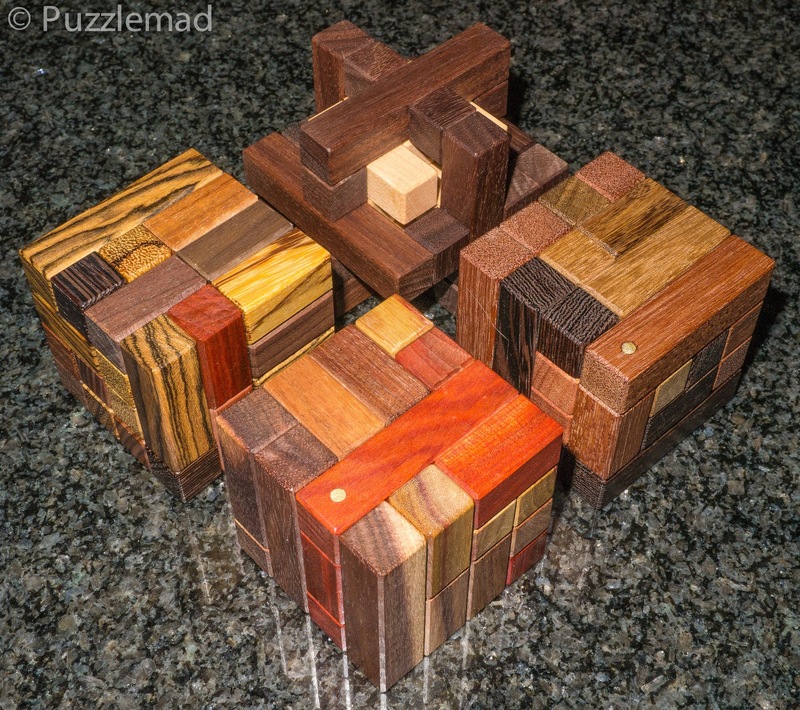 He sells his puzzles through his Etsy store which is well worth keeping an eye on for future updates. 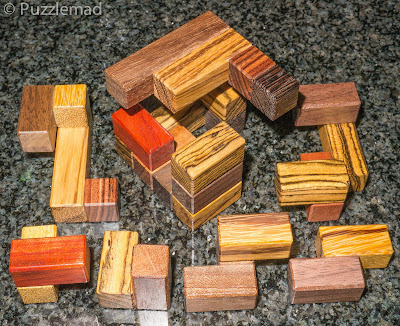 I scrambled the pieces for the photo and left them a few hours whilst I lay down to feel sorry for myself. An hour later, feeling not in the least bit refreshed having drowned in mucus, I set to work on the reassembly challenge. I realised at this point that the frame is not symmetrical which makes this a considerably tougher challenge. 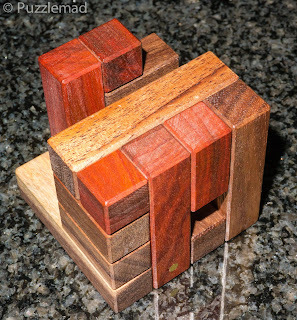 Idle random moves hardly ever solve a puzzle in my experience and they certainly didn't do it this time. 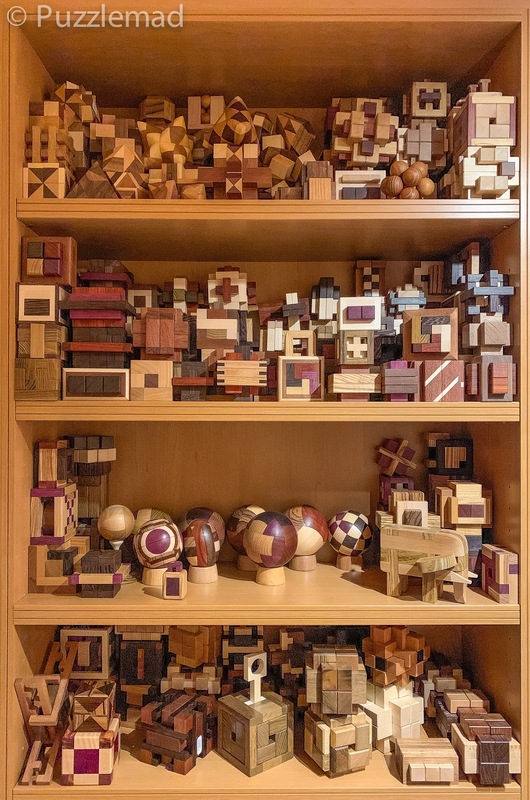 What they did do is show me that there were only a few positions of the frame where both ends of the double cubes could be flush with the surface of the frame. Then it was a matter of working out where it would be possible to arrange all three of them so that they could be flush. I was on my way - actually being logical! Not at all like me...these are damned good drugs! It took me another hour to find a very fun little sequence where the first 2 of them would fit in place and then how to move them in such a way as to accept a third. 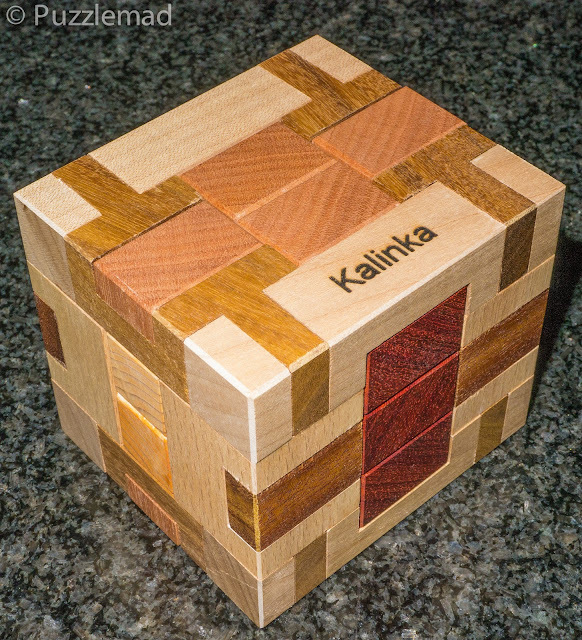 Yet another assembly puzzle solved despite my feverish brain. I should get sick more often - what am I saying? Ignore that! 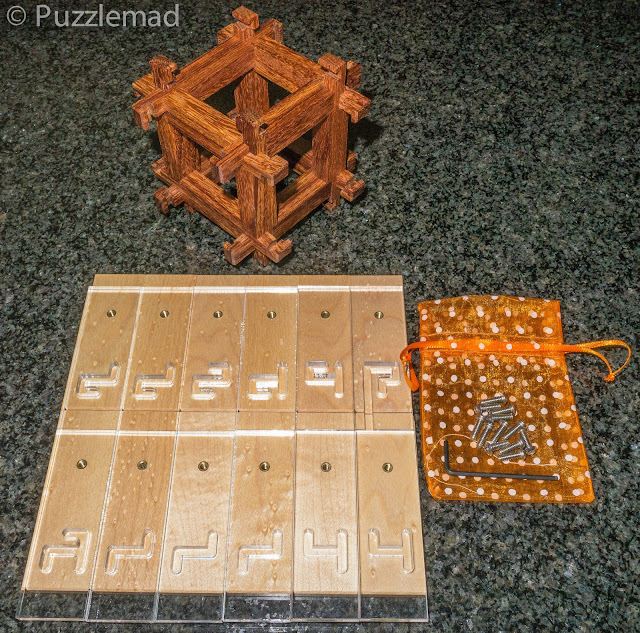 Finally - I went back to a puzzle that has kept me busy for nearly 3 months - Goodie! Yes, it really is a goodie! 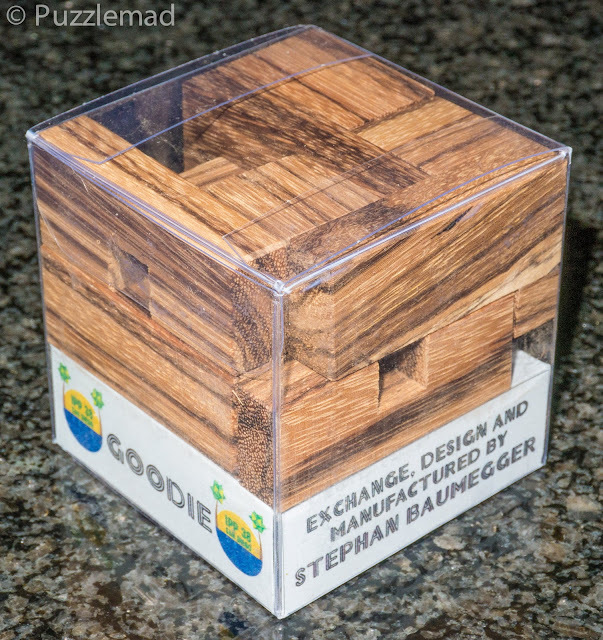 Goodie was an unexpected gift in the package from Stephan when I purchased the incredible Hydrant puzzle (reviewed here). It had been Stephan's exchange puzzle at the 38th International Puzzle Party last year in San Diego. He had designed and made this one from Zebrano and was rather pleased with it. 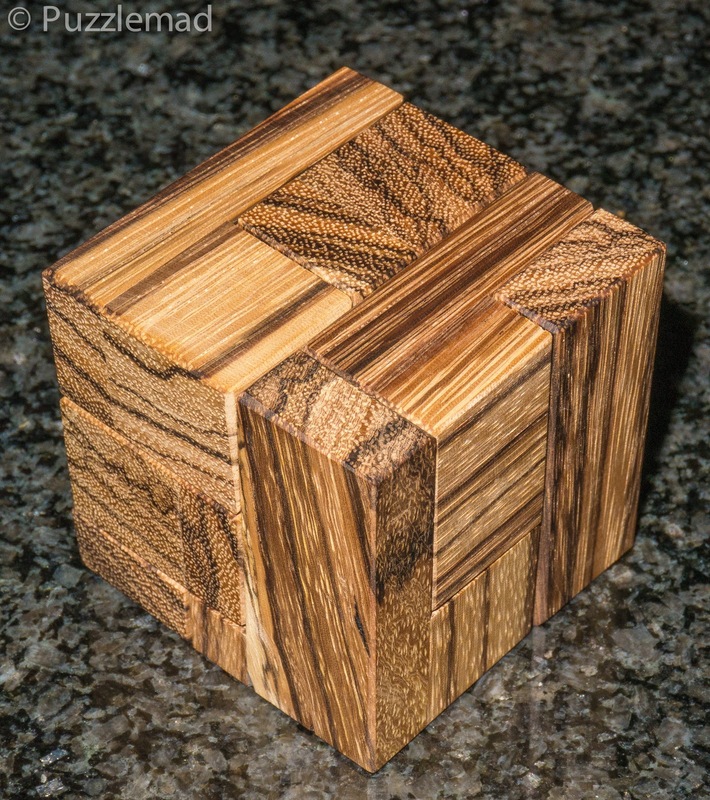 This is a dissection of a 5x5x5 cube with only orthogonal cuts and I was sure that it would not be terribly hard. Lord help me! How wrong I was! I sort of got a hint that it might be quite tough when, having taken my photos of the pieces, I tried to put them back into the box for transport to and from work with me...I couldn't get the bloody things back into the box and close the lid! Am I really that rubbish? Erm...yes! Sob! I took it to work a few times in a bag because, to my eternal shame, it took me a month before I was able to pack the box properly! 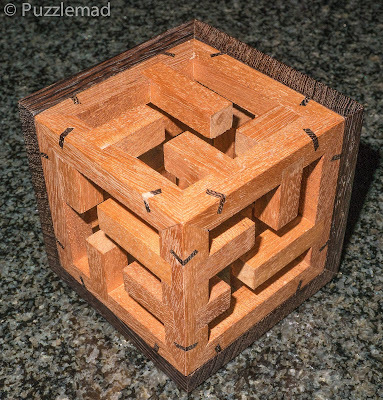 Having got myself fixated on this I worked on this puzzle many evenings for 2 months. I did try a few other ideas but I was getting nowhere and was starting to suspect that Stephan was laughing at me. I must have spent many many hours on this getting nowhere but always going back to those two pieces that fit together so well. 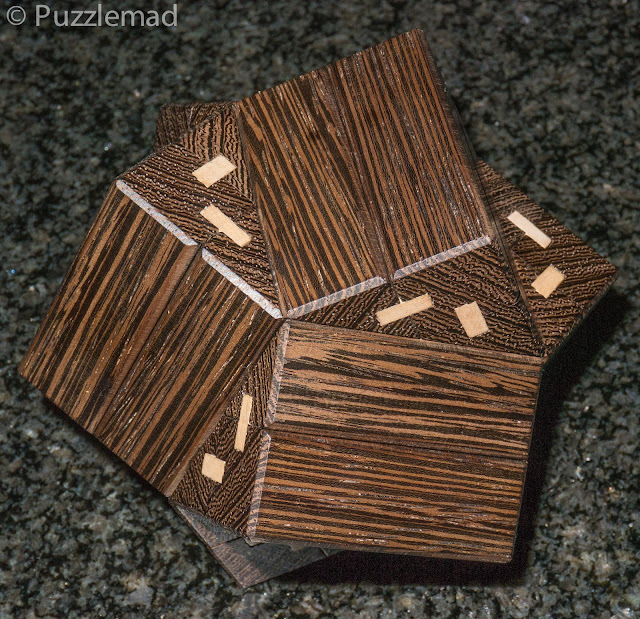 In the flush of my success from the other 2 puzzles above, I decided it was finally time to solve this bloody Goodie/Baddie! Another hour went by and another and I began to tear out the last few strands of my remaining hair when suddenly I had an epiphany! OMG! Aha! You sneaky b.......! How could I have been so stupid? Scrap that! I know I am stupid but how can I have been so stupid for quite so long? Aaargh! Only the drugs helped me solve it - I need more! If you get a chance to try this puzzle then jump at the chance! 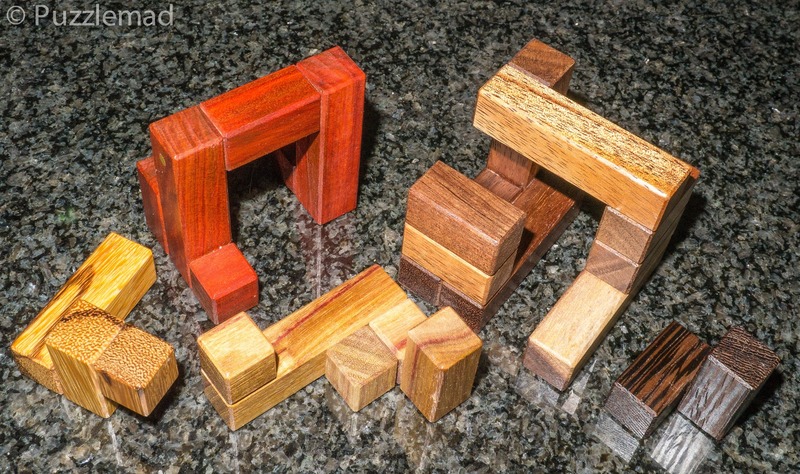 Have I finally cracked my inability to solve assembly puzzles? No, I don't think so. My brain has been altered by a befuddling virus/plague and then further addled by some very strong medication - I seriously do not recommend puzzling on drugs! Now, what shall I work on next? I am far too sick to go outside and partake of the peculiar British habit of gardening on a bank holiday weekend! I need to stay indoors and exercise by lifting small cubelike structures. I should also sit down with Burrtools to put this thing back together - it has been sitting in pieces on my desk for 10 days! 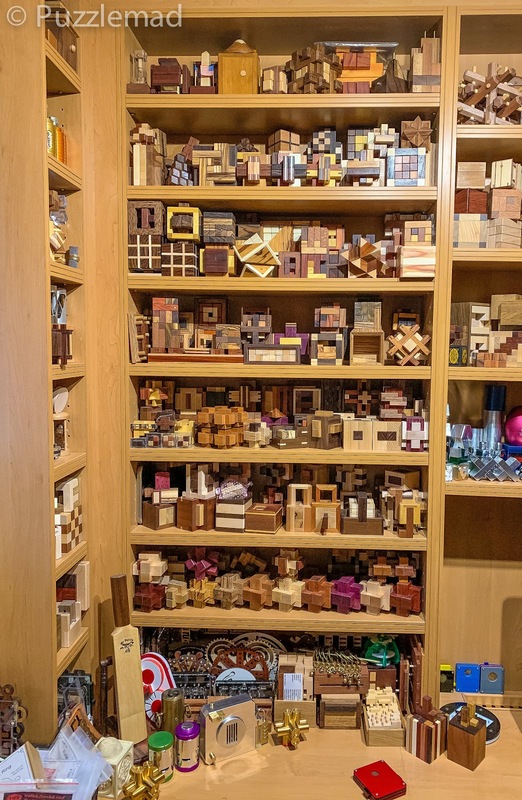 Terrax has lots and lots of pieces! Well, here I am running late! Mrs S has been away most of the week visiting the outlaws and, as is usually the case, she times it for just when my workload goes through the roof! I think she does it on purpose! 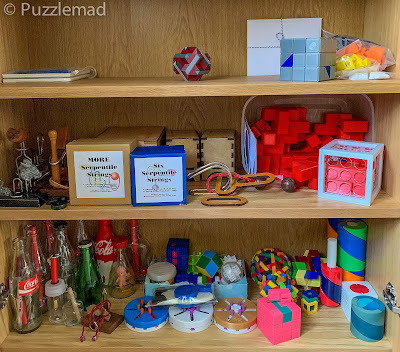 Instead of having plenty of time, home alone, to play with all my toys and write a nice blog post, I have been up to my eyeballs in work and even spent all day yesterday writing our on-call rotas! I only just finished up this puzzle this morning after doing all the chores that "she who scares the bejeezus out of me" had set for me to do before she gets home. My Stickmen (including a Stickboy and a Stickman apprentice) - plus a few other beauties. 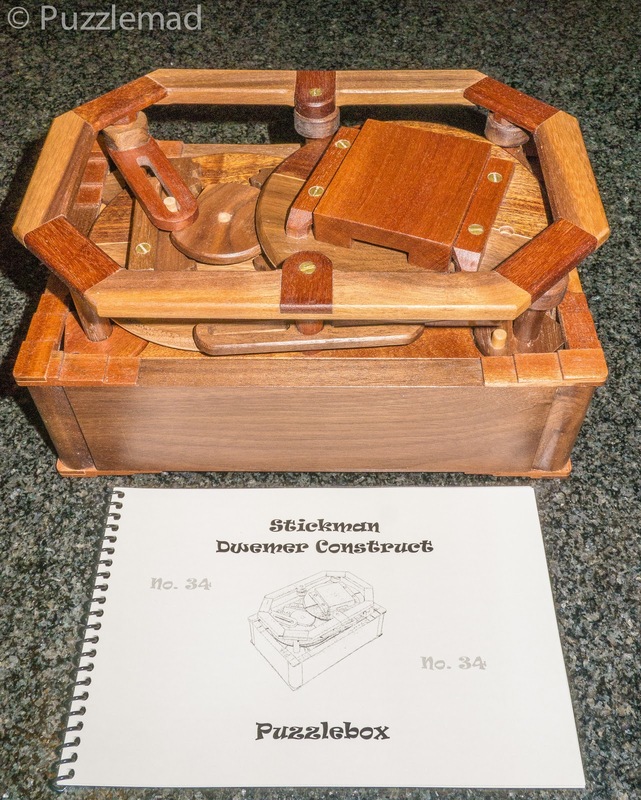 The Dwemer Construct Box is named after an ancient lost race in the Elder Scrolls, well known for their skills in crafting mechanical items. This incredible construction is big...REALLY big and pretty damned heavy too. 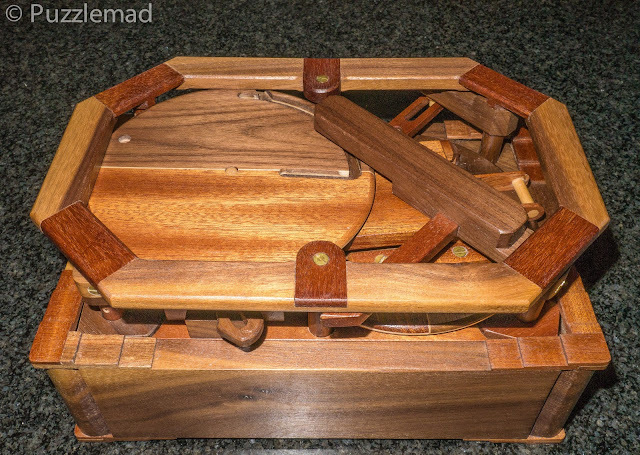 It has a handy top rail which is perfect for carrying it about. 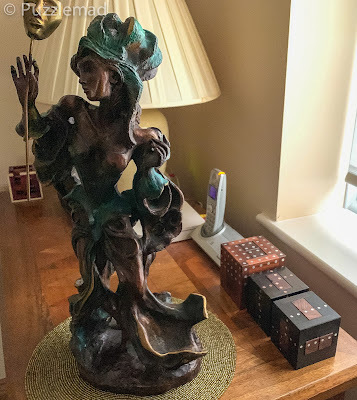 Every time I played with it I lugged it out of the display cabinet and then put it back after I had got stuck - Mrs S would not tolerate it being left lying around in the living room! 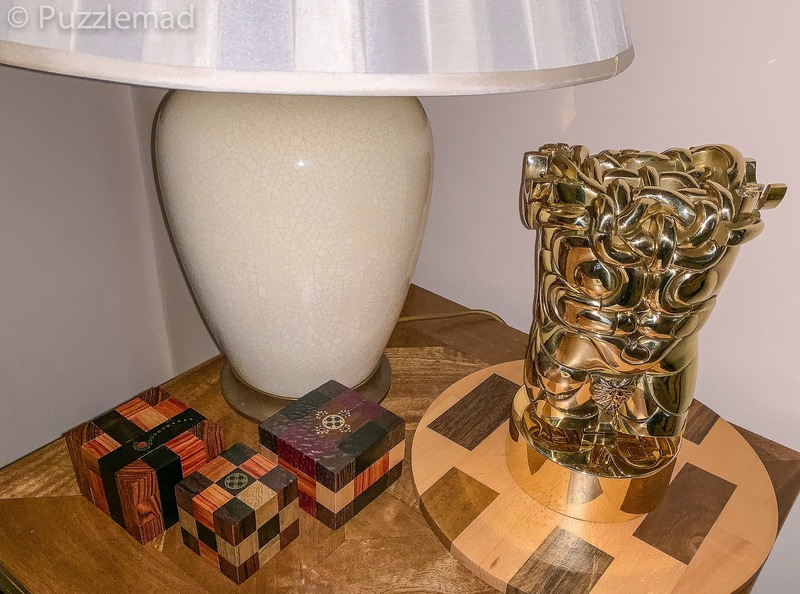 Looking at it closely it is clear that a huge amount of work has gone into it and pretty much all of it is crafted from wood with only a few well place brass screws holding components together. 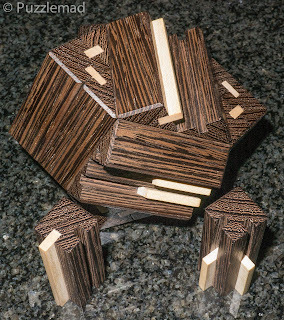 Lots of things turn and can interact with other pieces in mysterious ways. Not all are visible either - requiring a fair bit of deduction/guesswork during the process. 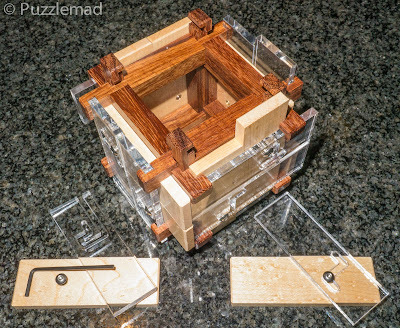 It is very quickly apparent how the lid is attached to the box and what is required to allow that lid to be removed...the issue is making it happen! None of the appropriate parts are able to move in appropriate directions as they are blocked by other parts of the puzzle. Inside is a bag of bits - including a screwdriver! OMG - I'm gonna have to be brave! OMG - I have locked the cats out of the room! I can't afford any mishaps here! The quality is simply stunning - everything is so perfect. The instructions for the disassembly and new assembly are step by step and quite easy. I have a small issue with an alignment of one piece in the new challenge that I am waiting for an answer from Robert but I suspect I have made a schoolboy error. 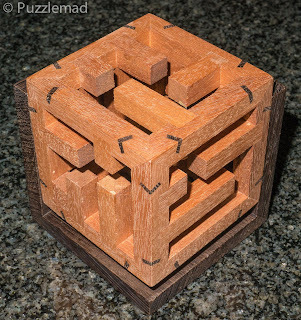 Even seeing the construction process for the second challenge amazingly does not give away how to actually solve it! 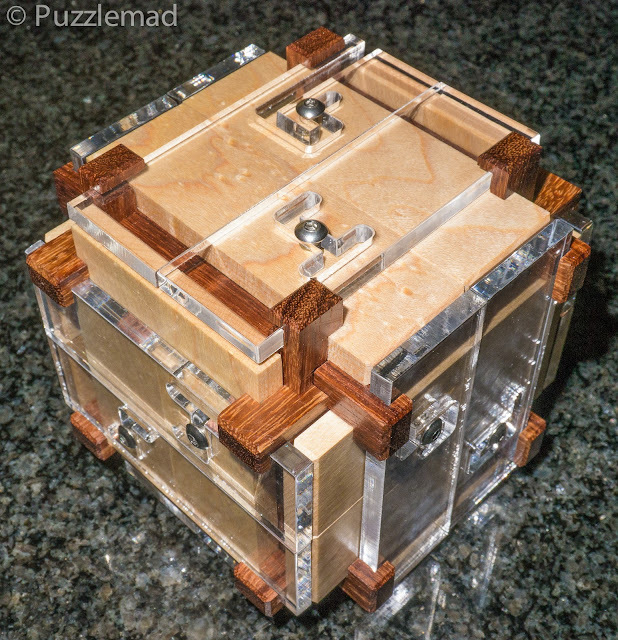 I know how some of the pieces interact but have no idea how to open the box. Probably another 3 months to solve this one! I'll keep you informed of my progress through challenge two. Now Mrs S has just arrived home from Edinburgh and I had better finish this and pay her some attention - if I don't then we may not make it our 25th anniversary and I won't be allowed to keep the Berrocal Goliath that is my present for lasting so long. Plus, I actually think I could do with a little bit of relaxation for the rest of the weekend - what little is left! For several months now I have been chatting with the genius (yes, you know that I am referring to Derek Boscch) about his latest ideas. Some he seems to struggle with but I always know that he will get there eventually. 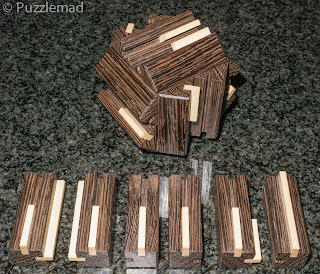 One design that I loved the idea of from the very first mention was the Split Maze burr. 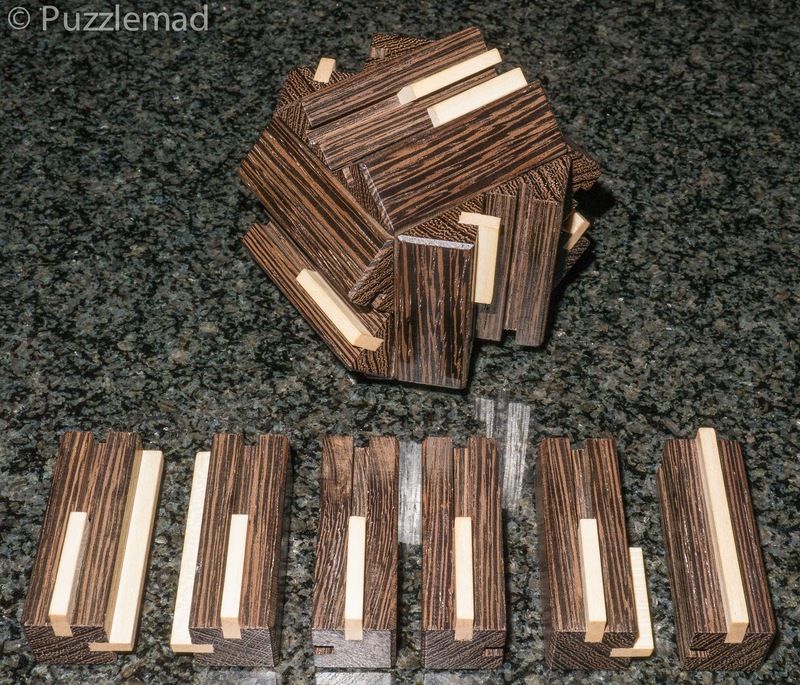 The original Maze burr was a wonderful design by Kagen Schaefer (now Kagen Sound) which predated my puzzling addiction but when Tom Lensch produced his own (more versatile) version I couldn't resist it and it retains a special place in my heart as the first ever seriously expensive wooden puzzle that I bought - I wrote about it here in my two year celebration. I went on to buy a copy of Derek's Rhombic version and absolutely love it even if it fries my brain keeping track of so many faces. It was probably the first sign for me how much of a genius he really is. 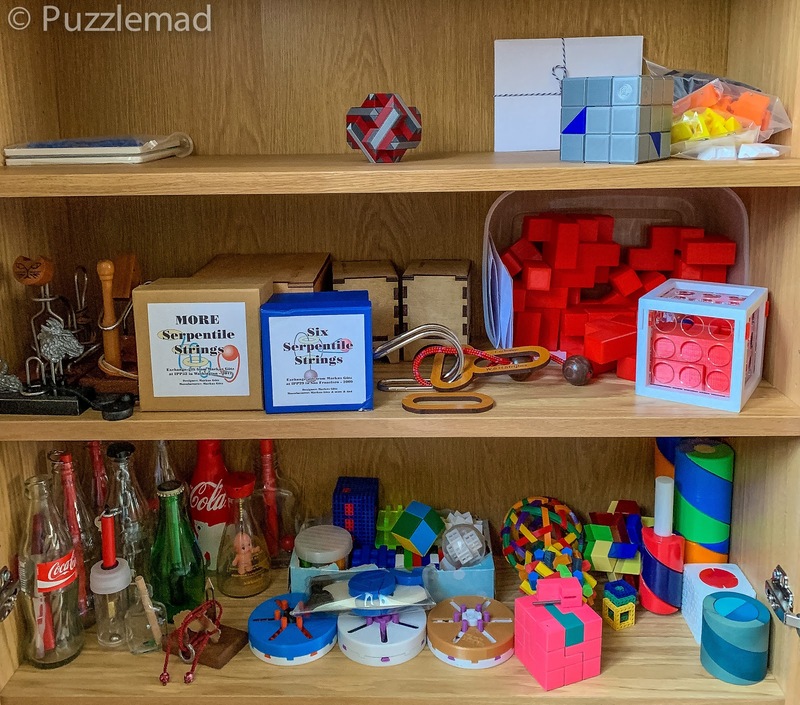 When he told me about his exploration of a version with 2 maze pieces per side I was at first amazed and then hopeful that he would be able to 3D print a copy for me to play with. 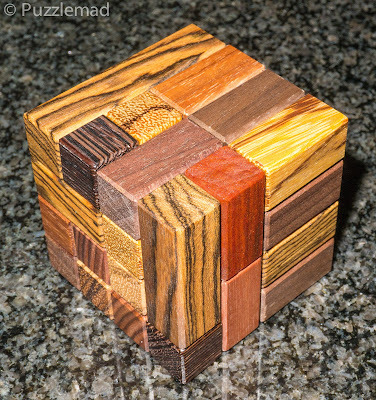 Later on, he showed it to the Doctor of wood, Eric Fuller, who said that he would look into making it in wood and acrylic. Very surprisingly, it did not take Eric long to work out all the kinks of the construction and Derek continued to work on a computer analysis of the best plate/maze combinations and a puzzle booklet to go with the commercial production. Eric's update (with quite a few stunning puzzles) went on sale just about 2 weeks ago with 61 copies up for sale. I was rather fortunate in that I had been assigned to be the "duty floor anaesthetist" that afternoon, providing cover for the theatre suite (17 theatres) and the recovery room and hence would likely be free when the site went live. At 5pm dead, I had set a todo alarm to check Eric's site and in between boluses of a vasoconstrictor for a patient, I quickly checked the site and made a purchase on my phone...thank heavens for the mobile internet and Apple pay! 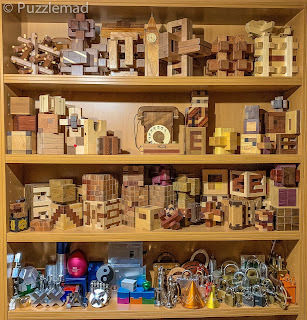 There were several other simply amazing puzzles going up but I had my eye only on one and after my recent splurge decided that I really should stop there! The rest of them sold out in a few hours as did the simply GORGEOUS version of the Casino puzzle which I had reviewed here and which was last years puzzle of the year from Pelikan. The premise is exactly the same as the other Maze burrs. 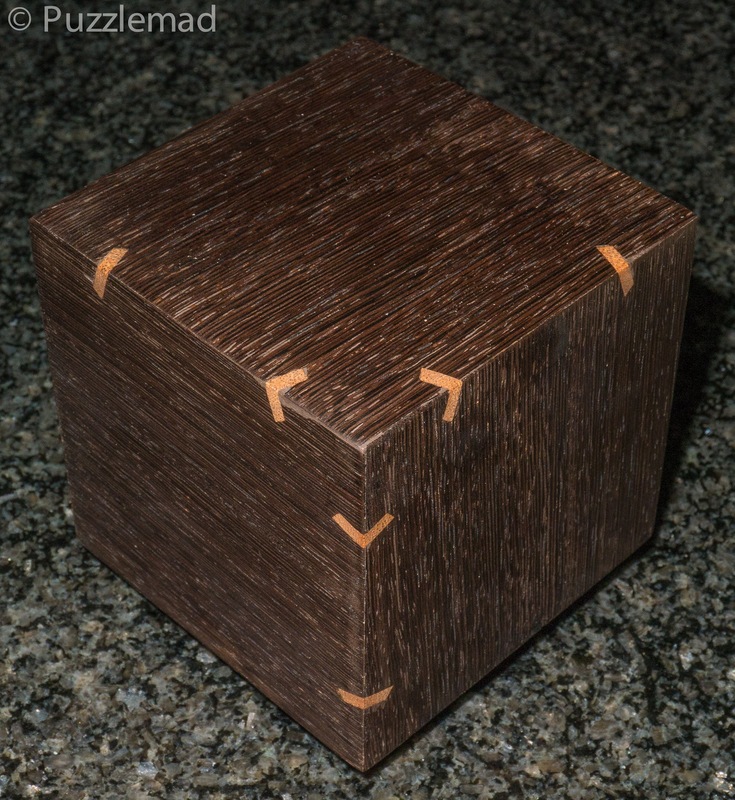 Each face has a shape cut into it with a pin protruding through from the layer beneath. Only one of the faces has a pathway from the shape to the edge allowing a face to slide off completely. As each piece slides back and forth it will make room for adjacent faces to move if the track will allow it. 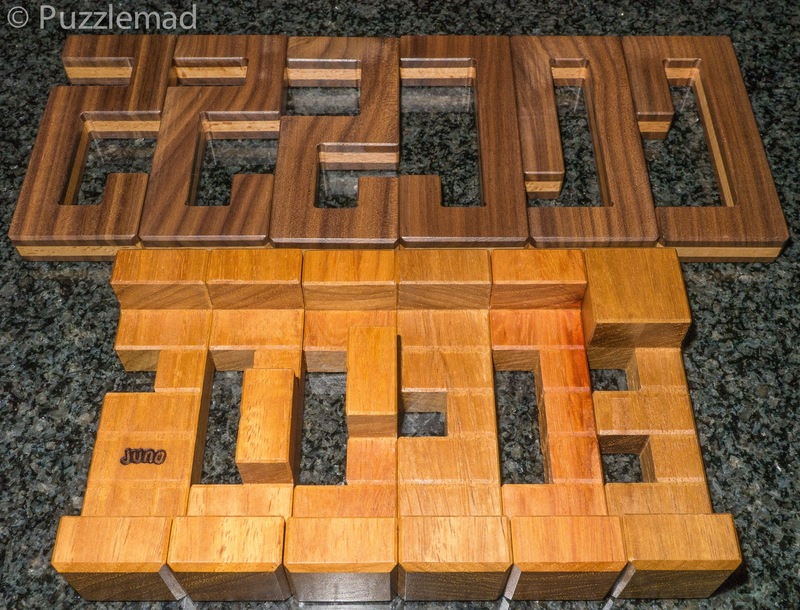 Even with the low-level puzzles I found this a real challenge - trying to keep track of 2 mazes per side is a huge challenge for my feeble brain and it did require a number of backtracks before I was finally able to get it. 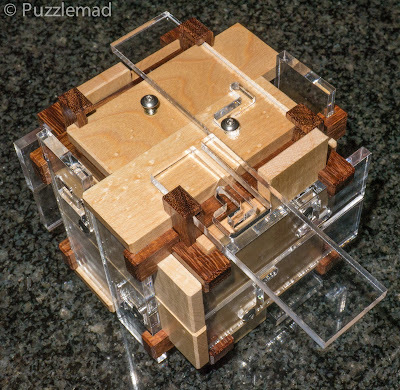 Once the first puzzle is solved then the acrylic maze piece with an exit can slide out of the puzzle. At this point, I discovered a catch - the pin plate could not come out - it was blocked by the acrylic piece on the side (you should be able to see it on the right in the picture above) and I then had to continue the maze movements to allow that blocking piece to drop and then could remove the pin plate. 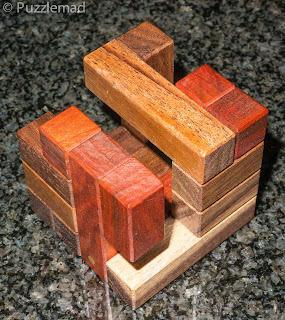 This means that there is often 2 challenges per set-up and thus even more puzzling fun. Inside is a nice little bag containing an Allen key to allow the pins to be unscrewed. 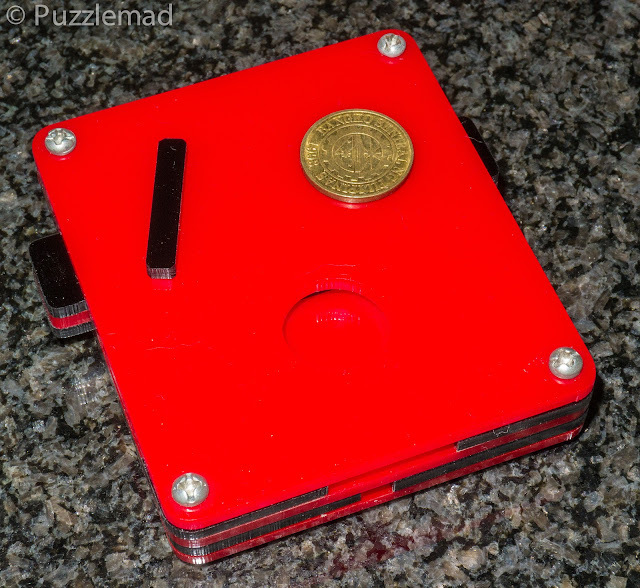 After that, the other pins need to be unscrewed and then the plates removed so that the next challenge can be accepted. Having these unscrewable pins is a huge advantage over the original Cocobolo Maze burr from Kagen as it means that at any time that you get lost or confused then it is just a matter of unscrewing some pins and then resetting the puzzle. It also means that the puzzle does not need to be moved through the full solution in reverse to set up each challenge. 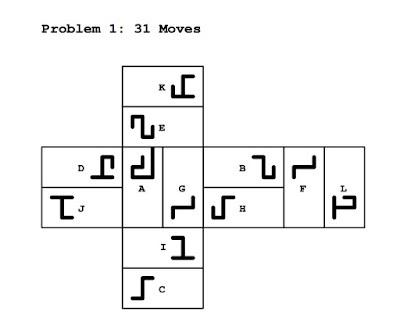 So far I have worked my way through the first 8 puzzles and am enjoying the progression - it certainly starts to get very very tough for me as I approach challenges requiring 50 moves - I suspect that I will never get above 100! If Derek can provide a whole bunch of level 30-60(ish) challenges then I will be a very happy man. Thanks to Eric and Derek for another fabulous toy for my collection! 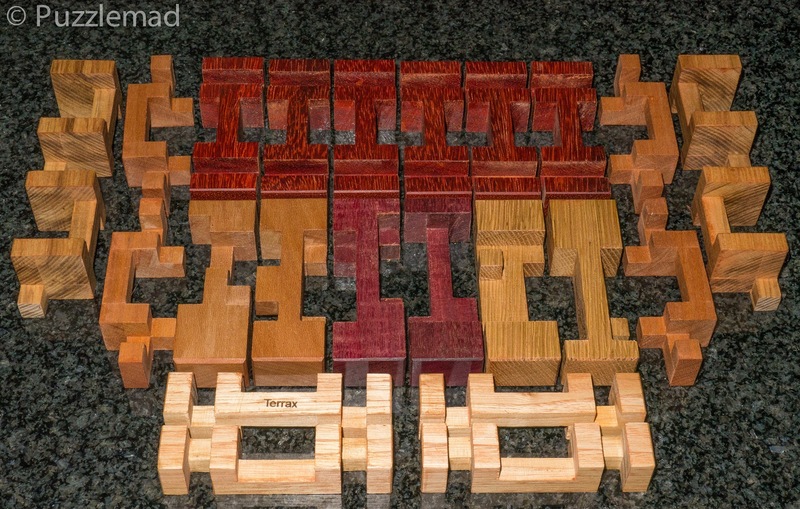 I do not know whether Eric plans on producing any more of these - he doesn't usually rerun a puzzle unless there is a huge demand - I am sorry if you missed out after they sold so quickly. My friend Yavuz Demirhan has been at it again! He released a bunch of gorgeous new designs on his Etsy store a few weeks ago and I jumped at the chance having been tantalised by them when he showed them on Facebook a while ago. The first that I bought and solved was the Maze cube (currently sold out) which consists of a cubic maze made from Sapele with Wenge slipfeathers which is partially seated in a frame made from the same woods (but with the woods reversed). The maze is seated on 3 maple dowels on each of the 3 faces and the cube needs to move through 3 mazes simultaneously to be taken off the frame. It is 8cm across each face. The aim is for it to be seated fully inside and flush with the frame. There is apparently only one solution to this. 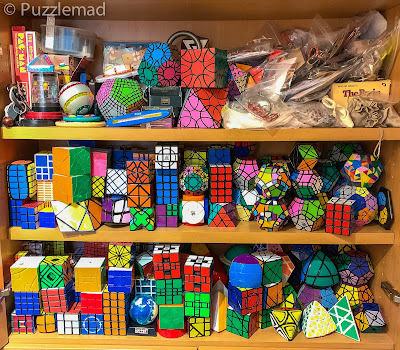 I initially did not understand and took the cube off without too much difficulty and then put it back to the same position and thought I had solved it really easily! Silly me! I then repeated it and realised that there are at least 2 paths to seat the maze cube in that starting position. At this point, I had my "Doh" moment and realised there was more to it than that. A proper analysis was required! Flush with the frame - only one approach possible. Mrs S Makes Me Tidy Up! If you go to my New Additions page then you will see that Mrs S bought me something very special for our upcoming anniversary. 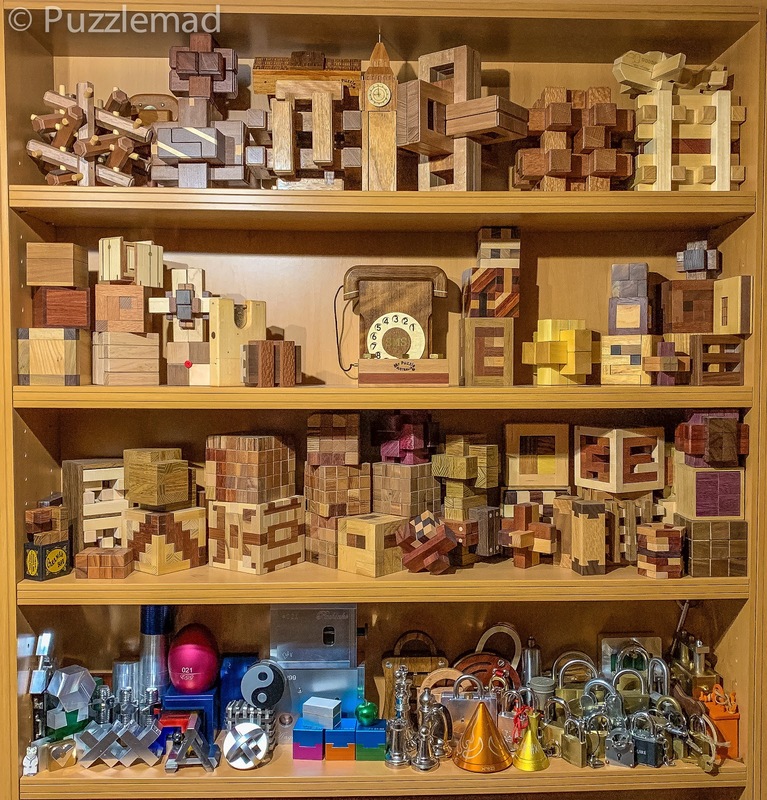 After it arrived she rather pointedly told me that my puzzle room/study was a shithole and I could not really disagree with her. She said that until I tidied it up, I was not allowed to play with any of my wonderful new toys. I could not say no after her present arrived earlier this week. The shithole is no longer a shithole! Yes, I really do need to sort this out! 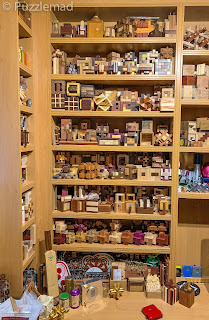 The rest of my collection has been partially reorganised - I will show this off at a later date. A Whack! Ouch! has been temporarily put on hold - phew! In mid-February, Juno and Yukari announced that 3 new burrs were going to be put on sale and I instantly jumped over to have a look. 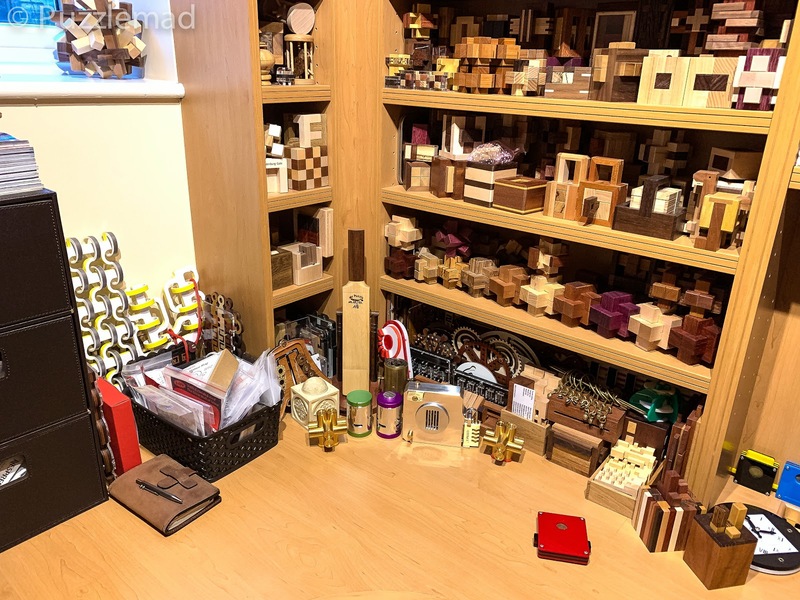 There is something special about Juno's work - he has a tremendous mind that seems to come up with brilliant stuff all the time and then, unlike a lot of what goes up on Puzzlewillbeplayed, he critically looks at the design to see whether it has anything specific to mark it out as worth making and us purchasing. Only a very small number of his designs seem to get out into the world for which my bank account and Mrs S are very grateful! Of the 3, I could not resist adding the Stretchy 12 burr to my collection and playing with it fairly soon after arrival. 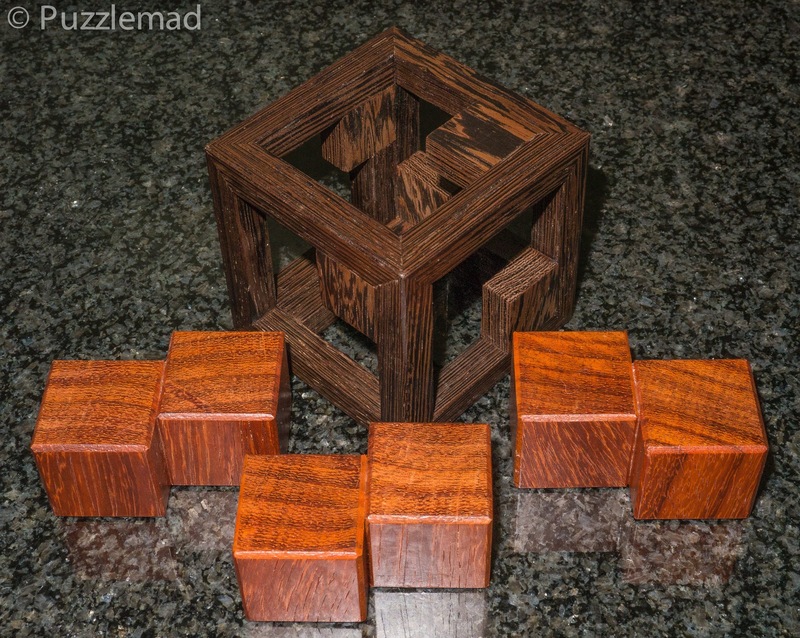 This diabolical puzzle requires 15 moves to remove the first piece from the assembled shape and another 19 moves to remove the second piece. 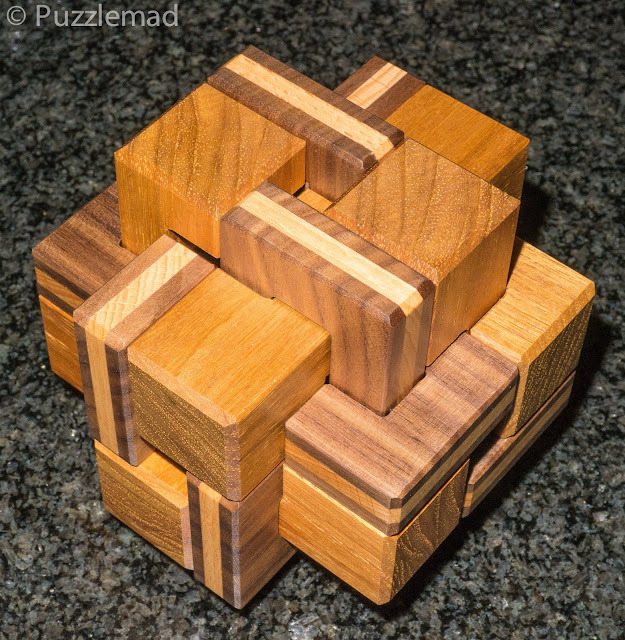 The puzzle and its pieces have 7-unit length. Just before the first piece and the second piece is removed from the assembled shape of the puzzle, it stretches to a 13-unit length. 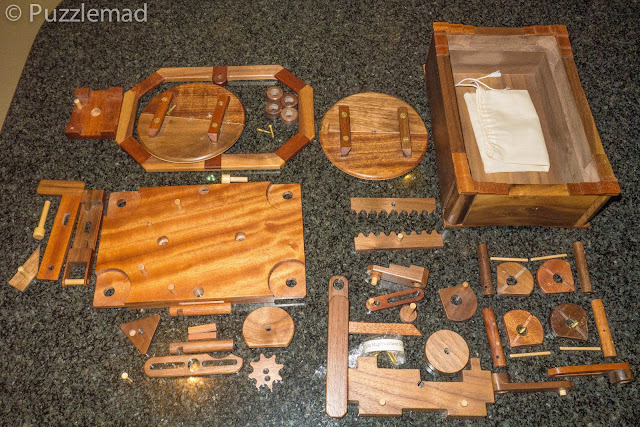 Every single piece moves during the assembling and disassembling process. It’s quite a transformation of the shape. Most of the movements follow the X or Y axis but very rarely the Z axis. 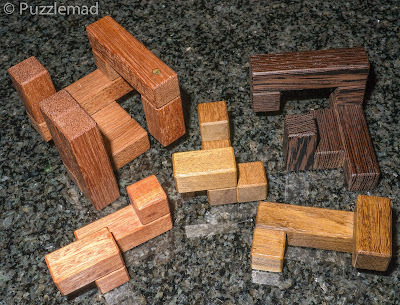 Find a flat surface and choose a stable orientation of the puzzle and then, you can easily push and pull puzzle pieces. 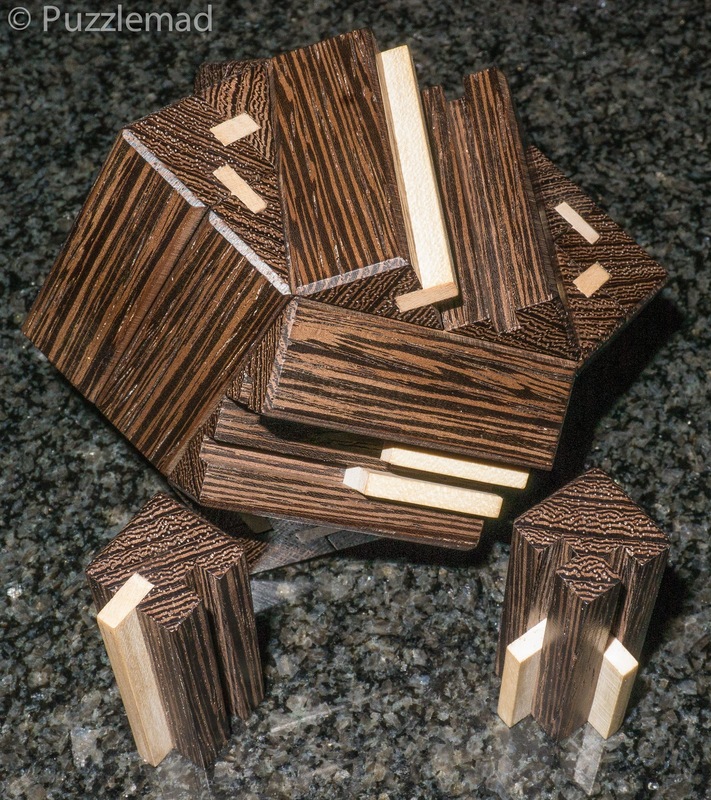 The fact that a higher number of moves is required for the second piece removal and the enormous changes in conformation during the solve process made it very interesting to me. The kicker, however, is the last paragraph - a burr puzzle that can be solved on a flat surface struck me as something that I really had to experience. When it arrived the first thing to strike me was the size - this is a fairly large burr at 10cm across in every direction and the fact that it is a mixture of boards and sticks too with boards made from his own home-made plywood. 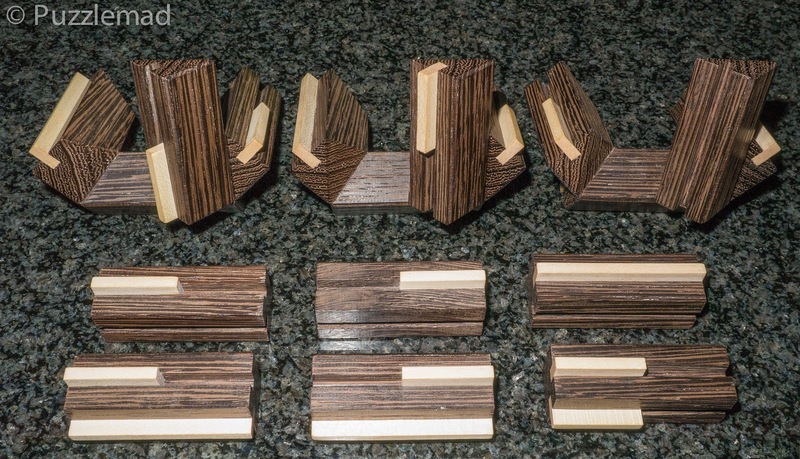 Not just any old plywood (this is layers if American Black Walnut surrounding European Beech - very striking) and the burr sticks are rather substantial made from rather gorgeous PNG Rosewood (aka Amboyna or Narra). Every part of this puzzle is substantial and an absolute delight to fiddle with - pieces are loose and slide easily. The construction is such that it is relatively easy to see inside and see whether certain moves might work or what is blocking a particular slide. The initial exploration produces some wild expansions of the puzzle which is great fun. I was bearing in mind the X-Y axis claim and found an orientation to explore in. After 12 or 13 moves I was stuck! 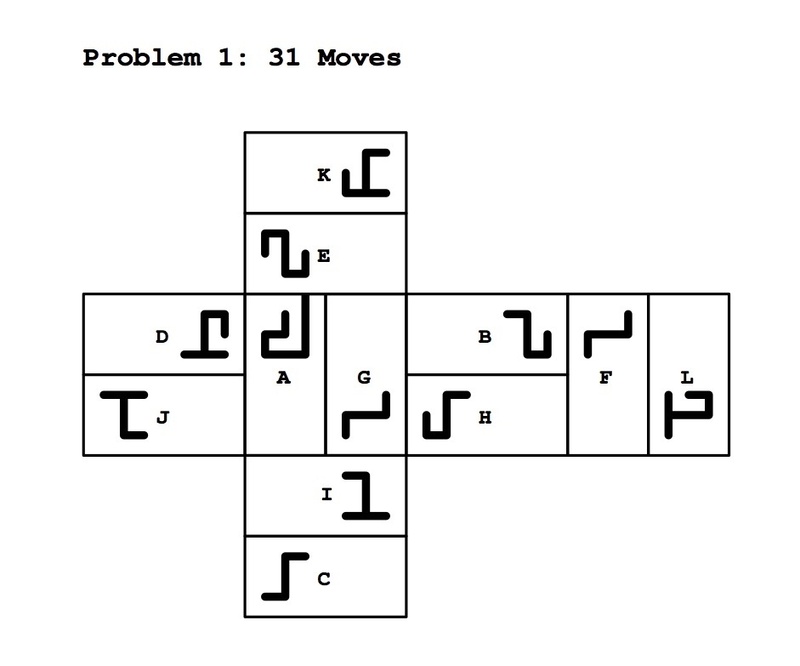 There were quite a few moves possible with several potential branch points but none seemed to lead anywhere. This stayed on my armchair for play for weeks with me getting nowhere - what was I doing wrong? Wow! How had I missed that? It opened up a whole new sequence and my first piece came out. Phew! I might just have a blog post for you. Then it was a matter of discovering how a really large number of moves might lead to the removal of another piece - there were a lot of possibilities but one approach immediately stood out and was successful. Brilliant! The remainder of the disassembly proceeded quite easily and seemed to remain very stable right up to the end which is very unusual. In my rush to disassemble it for the blog, I had not paid any attention to the disassembly order and orientation for anything other than the first 2 pieces and after admiring the beauty of the wood and workmanship, I was forced to resort to Burrtools for the reassembly - but if you are careful then you might not need this yourself. 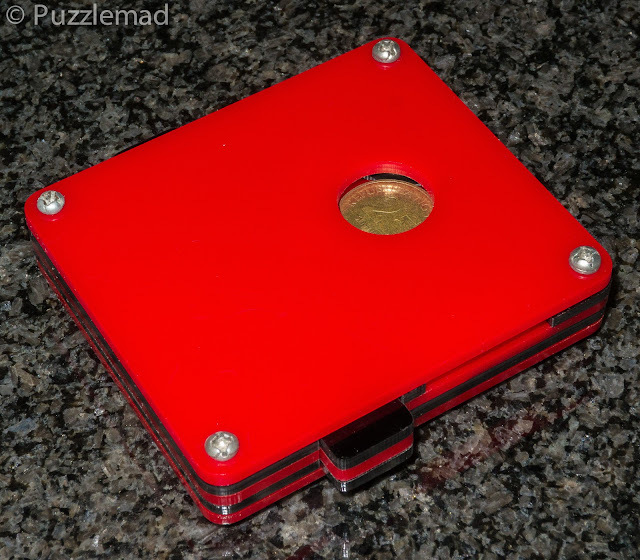 It is one of the most enjoyable burrs to play with and explore - there is one left on Juno's Pluredro shop and it is well worth adding this puzzle to your collection. 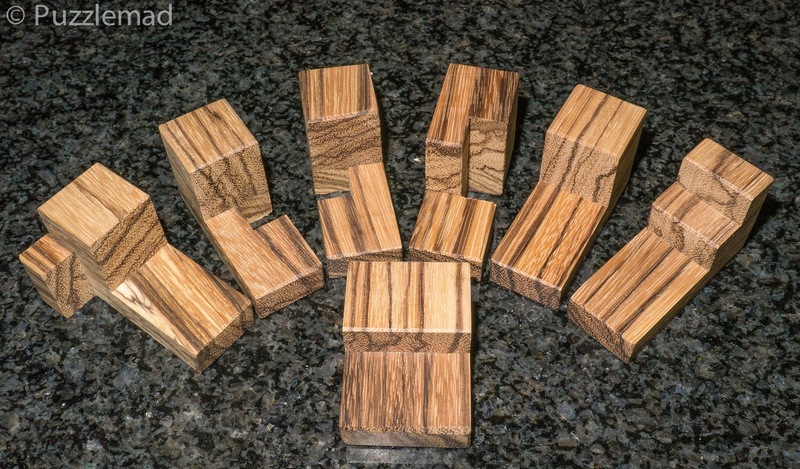 Whilst you are there you might want to consider buying one of the remaining copies of the Grooved 6 board burr #2 which was released yesterday. It looks fabulous and if it is anywhere near as good as the 1st version which I reviewed here and Allard reviewed here, then it will be a wonderful and fun challenge. I couldn't resist and it is winging its way to me now. 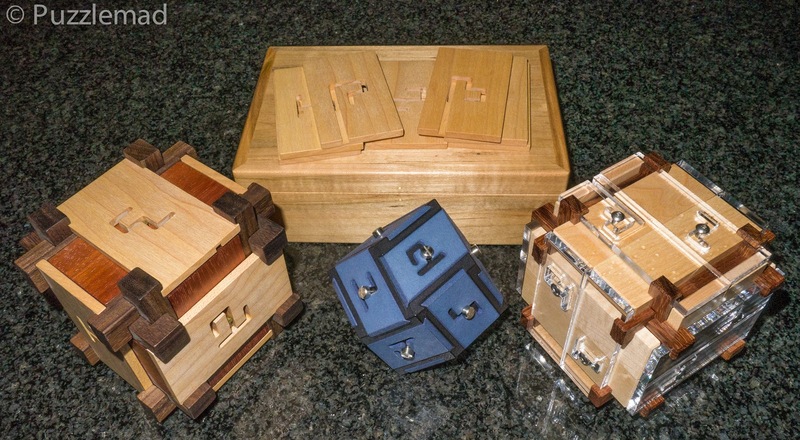 Many of you will have seen the shiny new website and the latest gorgeous production run by Brian Menold, the "published professor of wood". 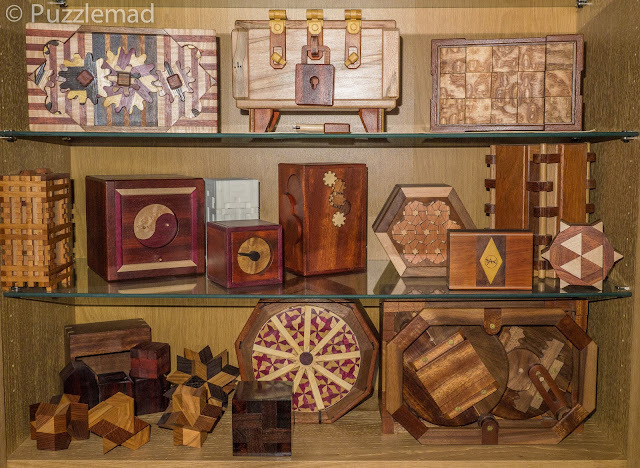 It included yet more of the amazing designs from the incredible 3D mind of Andrew Crowell. Andrew has been shall we say, rather prolific recently! Bernhard who is the world's foremost expert on Turning Interlocking Cubes has mentioned that there have been at least 27 new designs recently from Andrew and I, of course, wanted to get as many as I possibly could because I have a cube fixation! At least that is what Mrs S thinks. I reviewed the previous TIC from Andrew and Brian here and of course, it was fabulous. When Brian released another batch of four, I jumped straight away and the four beauties pictured above arrived. You will have realised straight away that these don't look like cubes! Brian asked whether I wanted them sent out assembled or disassembled and gave me a little advice. 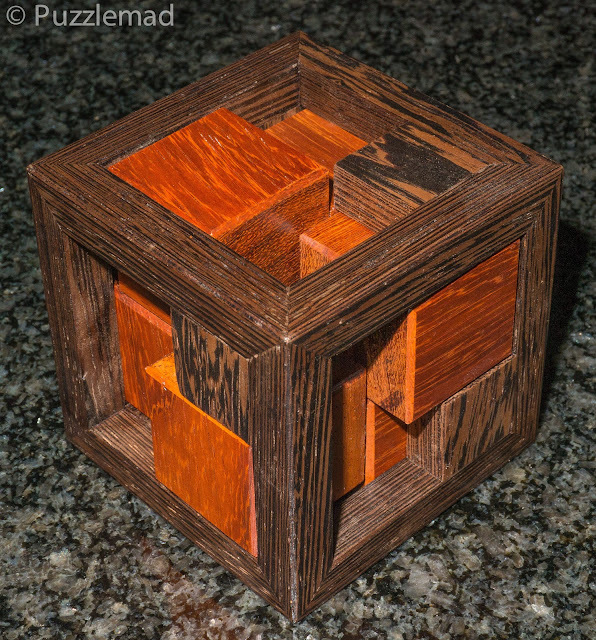 Only StarTIC #2 arrived assembled - it is a cube in a frame. I started with this one because I always find disassembly much easier than assembly and wanted to give myself a little headstart for the blog. made from Walnut and Maple, there is 1 easy to find move (it works under gravity) and then another fairly easy to find but rather unexpected move. At this point things get interesting. Opening up spaces in the interior further pieces can move and then the inevitable and confusing rotations begin. Oh boy! This gets fun very quickly! During the disassembly, several pieces have to rotate and I found it fun to explore. 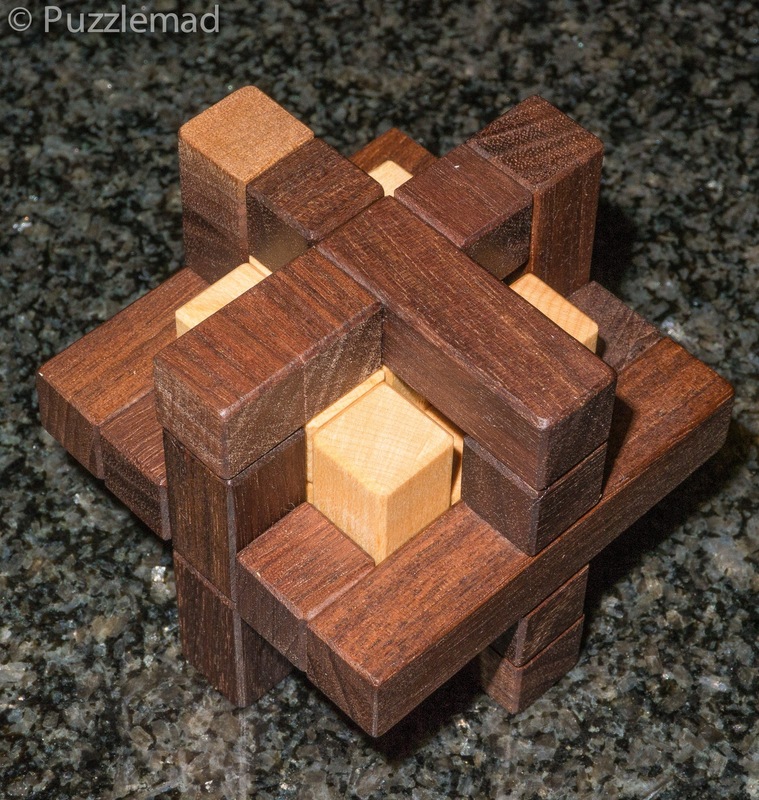 I think it took about an hour to take it all apart and as a starter puzzle, it was perfect. 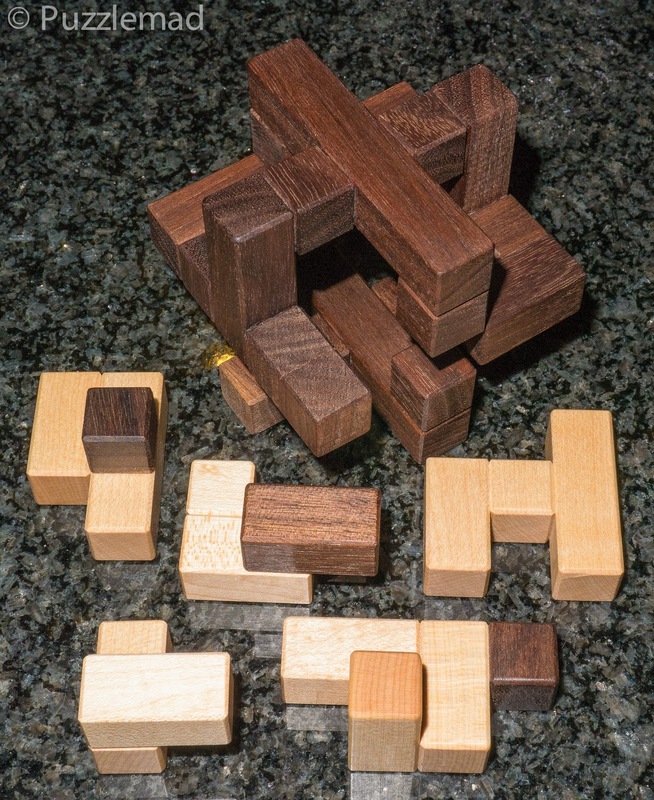 Having scrambled the pieces, I set to reassembling which was definitely a tougher challenge. 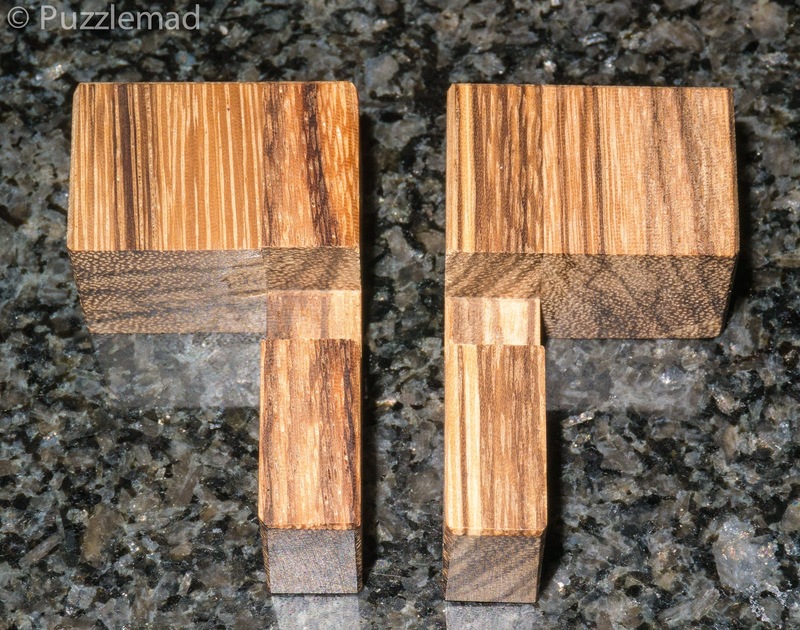 I had very rapidly forgotten the orientation and managed to confuse 2 of the similar-shaped pieces. Reassembly took me well over 2 hours and quite a lot of swearing. Why swear? Because if I could not put it back together again there was no solution and Burrtools would not be able to help me. Plus, remember that I am rubbish at assembly! I have to say that 3 hours plus of puzzling for $60 is pretty good and I had a beautiful wooden ornament/worry bead to display/fiddle with. 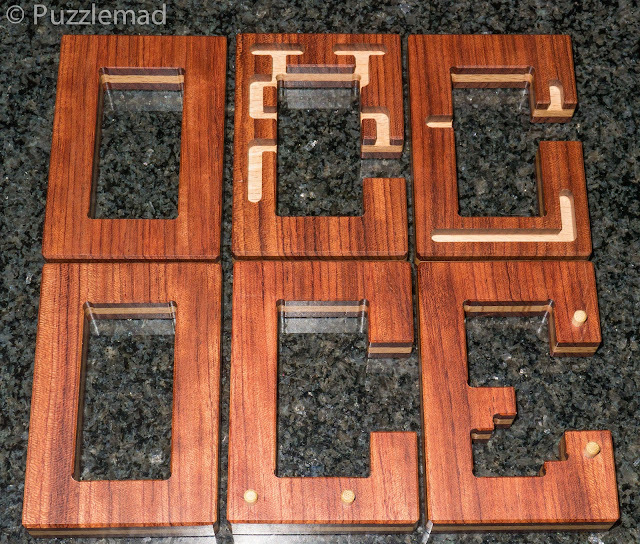 Next up was the one that Brian suggested would be the easiest and definitely best sent out in pieces, OcTIC. Not sure why that particular name when there are 5 rather than 8 pieces but he was right for it to be the starter. 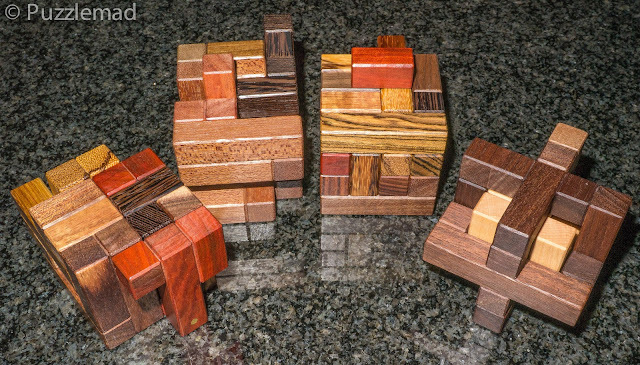 There are 2 nice large chunks of cube which are a good pair to begin with and not much of a problem working out how they fit together. 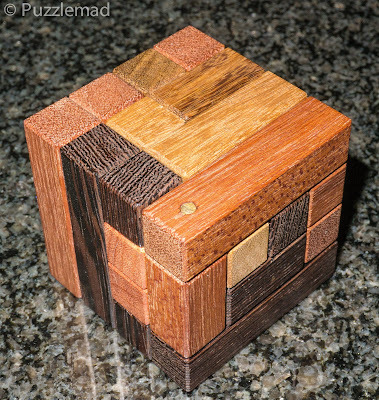 Having done that, it becomes fairly obvious where the remaining pieces fit inside even if they won't just slot in. 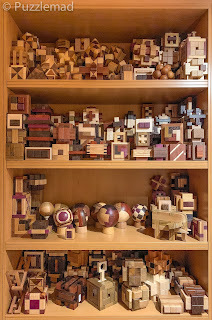 My fixation on the cube shape was my undoing! I could work out how to put most of the pieces inside (even with the nice easy rotation move for one of them) but I could not get all of them in. Everything I tried ended up with one piece outside. My fixation was killing me! 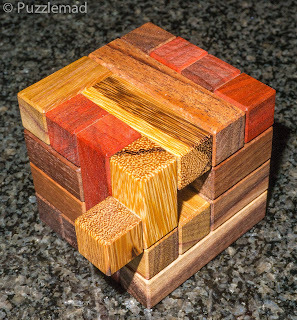 It took a couple of hours before I finally let go of the initial cube shape and started with other pieces first. Then I discovered another unexpected rotation and a lovely sliding sequence before my Aha! moment was complete - beautiful! It took an embarrassingly long time! So I was 3 days into my puzzling when I got sick and ended up with a nice pile of new deliveries and no energy to open them! 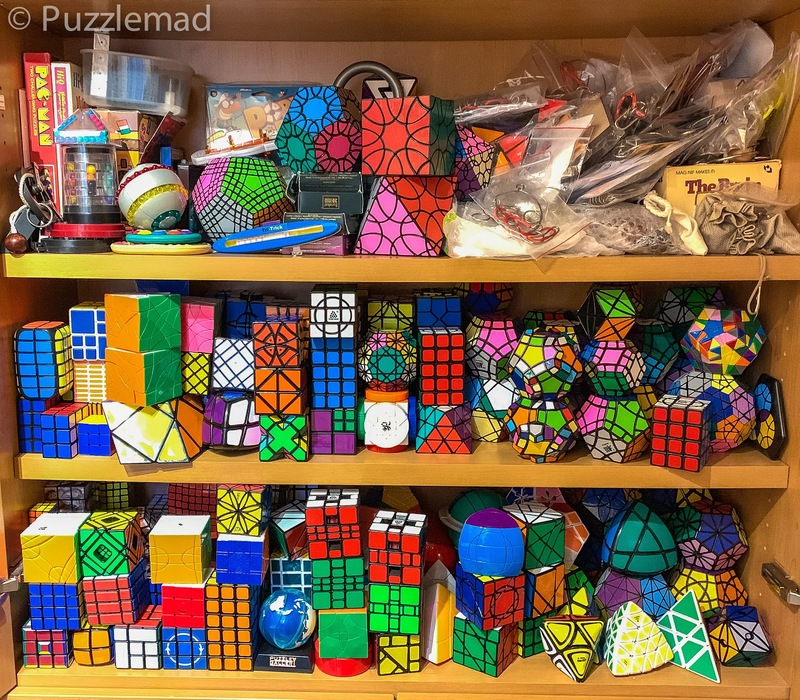 2 days later I was back and puzzling again! I went with the HypnoTIC cube which Brian had said was pretty tough but doable as an assembly puzzle. Ashamed to say that it took 2 days to find this! 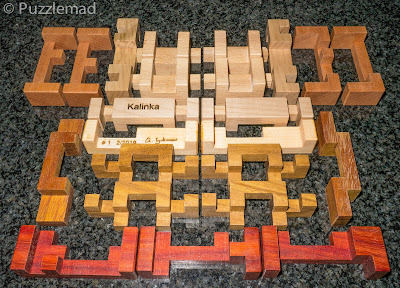 Having done this the next 2 pieces fit in with multiple rotational moves and setups but a very satisfying search. 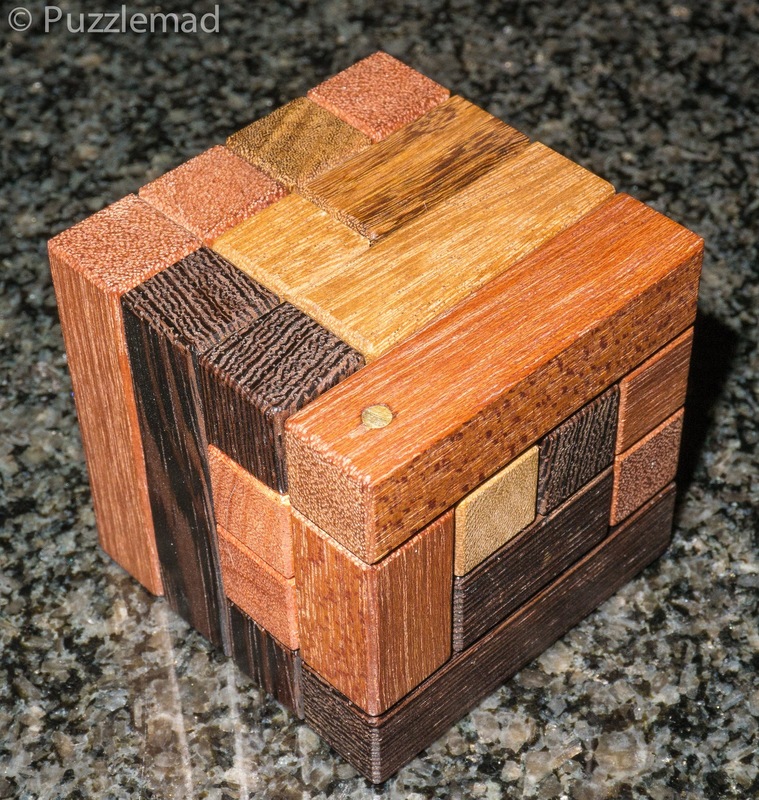 The last piece fits in ONLY if things are absolutely perfectly aligned. It requires a very subtle rotation and position - if you are out by a degree or 2 and not aligned right then no chance. Another day to find this and finally after many hours AHA! OMG! It nearly killed me! 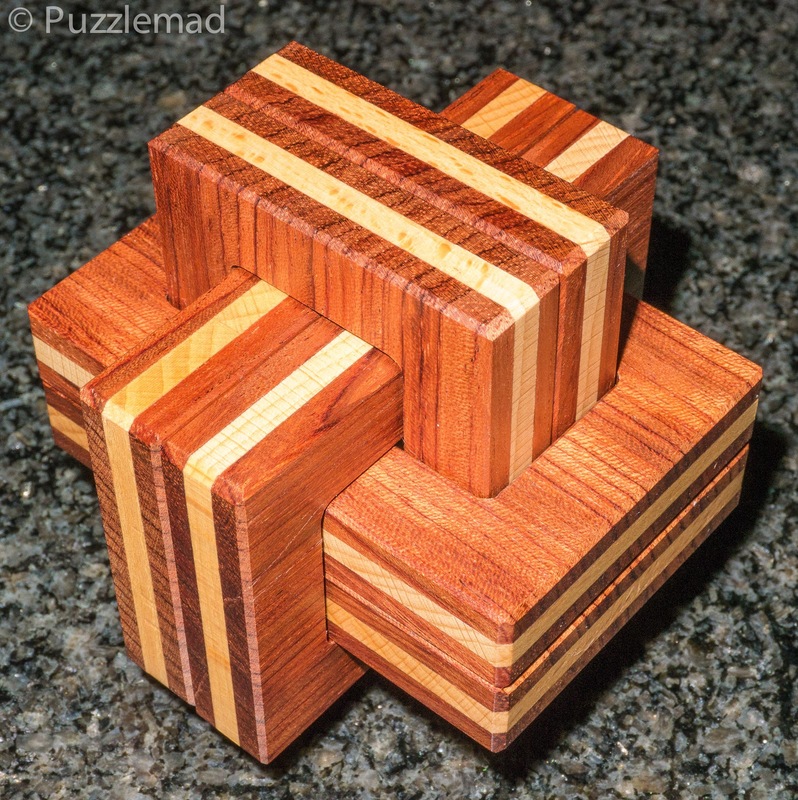 A packing puzzle with rotations? Hell yeah! Again, a gorgeous choice of woods and I could see that with so many smaller pieces to be packed inside that this might be a little challenging for my tiny brain. As usual, I started with the larger pieces and immediately struggled. 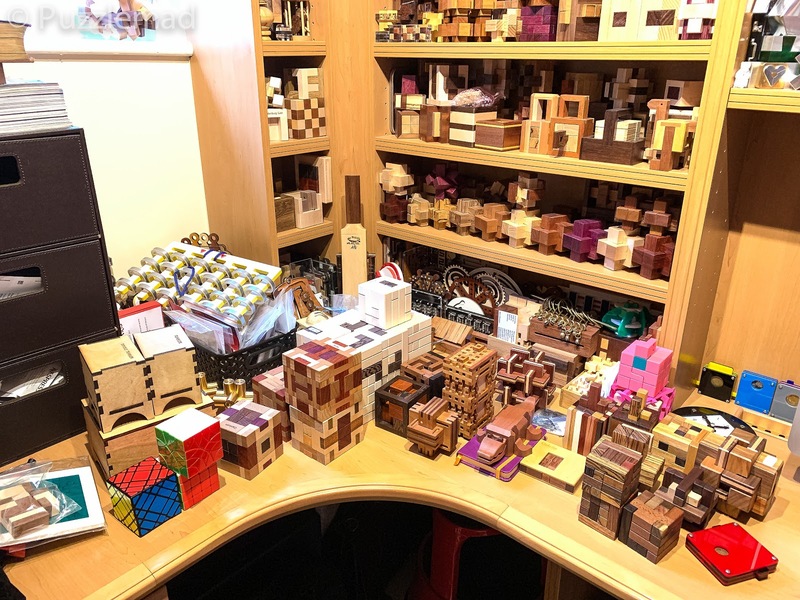 Each of them could fit into the larger cube but would not leave enough space for the other one to go in and extend the full 4 unit length across the cube. I gradually found a second method of adding a long piece but it still would not leave a channel for the other to pass through. 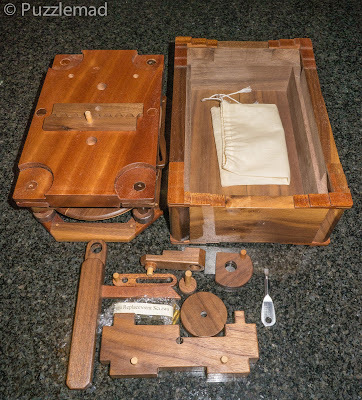 Uncharitably, I did start to think that Brian might have put the wrong pieces together in the box but I quickly shrugged that suspicion off. I was fixated...YET AGAIN! It took me the whole of Saturday evening before I could even put the first 2 pieces into position! Damn! I am rubbish at puzzling! Having worked out the 2 big pieces it was time to work on the smaller one. How hard could they be? Stupid boy! There are a number of ways that 2 or even 3 of the small pieces can go inside and once or twice I found a technique to get them there. After that, I either discovered that the space for the final piece was split into 2 sections or it was impossible to put it in there. The sequence and positioning took me another 3 hours and the Aha! moment was fabulous! I could not believe how clever that assembly was. Brian was right that they should have been sent out in pieces. Only just before writing this article did I finally solve it - nearly missed my deadline! Phew! Another stunning cube for my fixation and to reinforce to Mrs S that all my toys look the same! Packed them in! 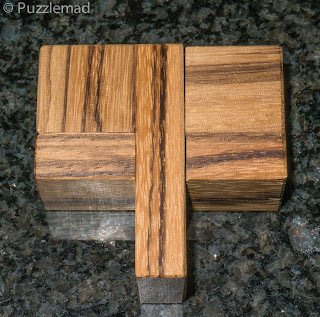 Brilliant puzzle! If Brian or anyone else produces these again then just say yes and hand over your cash without question! They are wonderful additions to anyone's collection. Finally able to take a collection photo! Now how should I store them? Assembled or not? It's a bit of a dilemma. 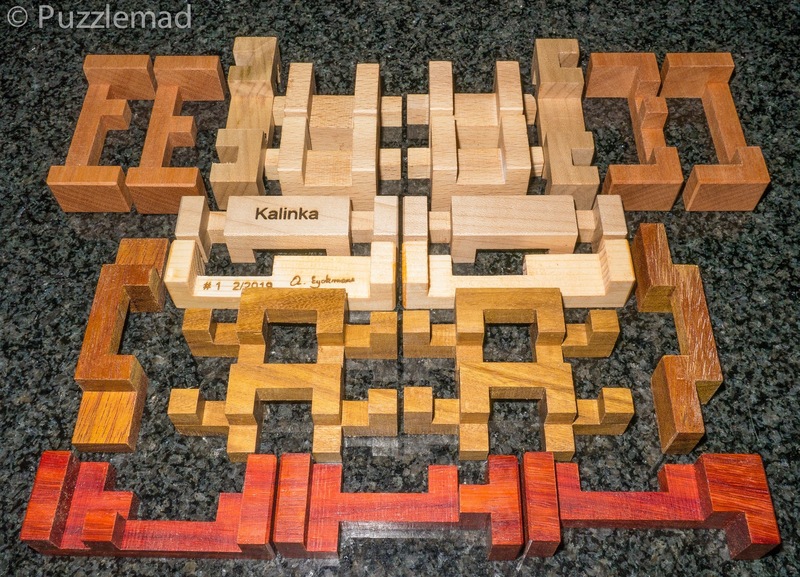 I might have received a few more of this series of puzzles from a certain German "enabler" friend of mine. How many? More than I am letting on to and enough to make Mrs S very VERY angry! OMG!